There are many places to go horseback riding in and around Marbella. The Estepona Equestrian School known as the Escuela de Arte Ecuestre Costa del Sol is only a 15 minute drive from Marbella and offers a beautiful setting to learn how to ride. The Estepona Equestrian School not only offers riding lessons, but also has an indoor riding arena thats seats over 1200 people for shows, a 7000 square meter outdoor arena, pony club, banquet hall, restaurant, riding shop, harness workshop and its own leather factory. 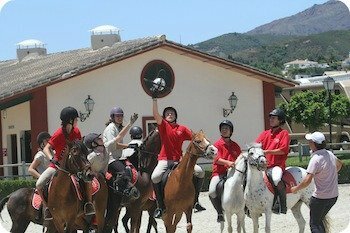 This school is approved by the Spanish Horse Riding Federation and the British Horse Society (BHS) offering official BHS examinations and qualified BHS instructors. Children under 13 yrs have classes in the Pony Club either in the morning or afternoons Tuesday through Sunday. 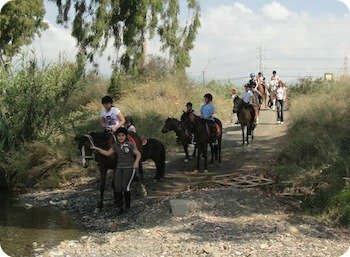 Getting to the Estepona equestrian school from different areas of Spain and Europe is easy due to the excellent Spanish road infrastructure and the international airports of Malaga and Gibraltar linking us with the rest of the world. Whatever your level of ability we can cater to your needs, enhancing your self-confidence, responsibility and horsemanship skills. Our outstanding Junior Courses make learning about, working with, and riding horses fun, bringing children from all over Spain and Northern Europe, for riding courses, dressage clinics and jumping courses. Adult tailor made courses are designed to their needs, be it to enhance riding and horse care, for riding competitively or purely for personal gain. Location: Rio Padrón Alto s/n (no number). Take N340 toward Estepona. Exit 159, you'll see the sign on the highway across from Laguna Village. Continue for several kilometers and follow signs to the school, which will be on your right. Prices: Private class (45 min): 60; group classes (45 min): 30; Helmets (obligatory) 2 rental or purchase in shop for 30. Mom: "A fantastic environment to learn to ride"
...The kids rode ponies in the outdoor covered pony arena that was guided by trainers. It was nice to see that they made them wear helmets and a body vest, so I felt safety was a priority. The restaurant staff was friendly and the food was really very good, particularly for a child's party. The skewered shrimp was excellent. I have recently visited the school again and was impressed with all the changes. There are a ton of activities taking place here in this real western cowboy-like atmosphere, from horse jumping shows to quiz nights to summer camps. Follow their events page for postings of their events or look at our Calendar of Events if you want to plan ahead. It is really easy to find the Estepona equestrian school now. Look for the large signs with clear directions. As soon as you peel off the highway (N340 - right near Laguna Village) keep heading up towards the mountain and look for signs on the right hand side. If you reached the Estepona exit you've gone too far. My daughter used to attends drama classes at the The Marbella Youth Theatre, which was located within the premises of the Estepona riding school, so I have spent a lot of time here. I didn't mind at all, because waiting for her classes is pure enjoyment. I remember to bring my iPad (free wifi!) to check my emails, order a cup of coffee and sit back in the comfortable leather sofa. No pressure! After my daughter's class she may ask for a muffin or an ice cream and we sit and watch the horses trot by. Our family has often eaten at the restaurant El Abravedero and you can always count on an excellent piece of meat and a variety of salads. They have an outdoor barbeque and offer quality meats with the most amazing barbeque sauce. It's best to plan on visiting the restaurant when there is a show jumping competition, social dressage or other event. The atmosphere here is just electric and if you don't feel like learning how to ride yourself when you see it, then I don't know what will. ...We arrived on time for class and as my 7 year old was getting ready to ride, this was her first time, so she was very nervous, the instructor started yelling at her and she became so upset that she decided not to take the class. My 5 year old ended up taking the class and did fine but the instructor spent the next 45 mins yelling at the kids. I think that if you have a tough child that doesn't mind being yelled at by someone they don't know, it could be a good fit but otherwise prob not a good choice. Also, if you have a child that already knows how to handle horses and is comfortable it could be a good fit. I had a much better experience at the riding school in Ojen they are much more patient and caring. I am sorry, but cannot recommend the Estepona Equestrian School. Julie: "Definitely worth a visit!" ...Here goes, the best vet on the coast has her clinic here - The Pointer Clinic (I wouldn't take my dogs anywhere else, and I have 3). Salvador has a doggy grooming parlour that is very competively priced and excellent. Toni, has an organic vegetable and grocery shop, her fresh eggs are to die for, you will never buy them anywhere else once you've tried them. The infamous, Selina from Talk Radio, has an excellent jewellery shop and next door to her is Sally who sells Ted Barker Silk. The restaurant is really pretty and the food is excellent. There is also leather workshop and a flower store on site. It is definitely worth a visit on a Saturday afternoon when often there are riding competitions to watch while you soak up the sun with a coffee. I love it and I'm sure you will too.